Finials are a great way of decorating your lidded pots. They can be added as an additional piece, made from a contrasting timber, or formed as part of the lid in one piece. The finials should have crisp definition and be wider at the bottom than the top. To assist in achieving this, turn the timber into a taper before starting the finial shaping. 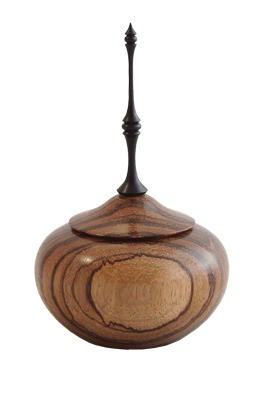 I personally prefer to add a separately turned, contrasting timber finial giving an additional element to the turning. For this, turn the lid and drill a small hole to receive a finial, taking care not to drill too deeply that you go through the lid. Select the contrasting timber, ideally a small pen blank, to be used and mount in a chuck with 25mm pin jaws fitted. Pulling up the taildrive for initial support, turn the small blank into the round. Taper the timber down towards the taildrive and start with your desired shaping. The 2-3mm of timber at the end will be waste so take this into account when starting the shaping process. When the tip of the finial has been turned, remove the taildrive and refine the shape; a skew chisel can be used to form crisp detail. You now need to sand this small section, taking care not to round over the crisp edges you have created. 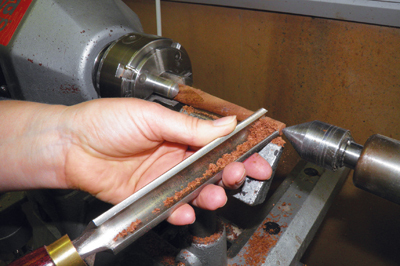 The finish left by the tool does not require aggressive sanding so start sanding with a piece of 240 grit abrasive or finer and finish with 600 grit. If you intend to turn a very fine finial it is also advisable to apply friction polish at this stage. 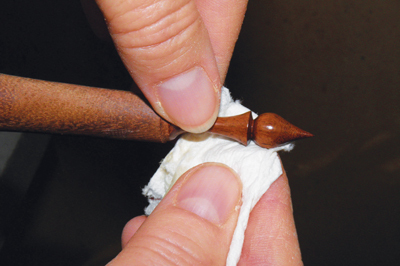 Don't over apply the polish, as too much will result in rings of wax spoiling the finished item. 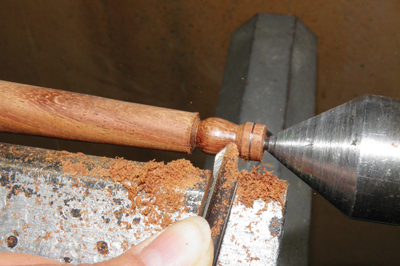 Continue shaping the finial, a small section at a time, sanding and polishing as you go. As the finial becomes finer the turning may begin to wobble, so a little support will be required. Place your finger behind the piece of timber and your thumb in front, with the tip of your thumb touching the top of the toolrest to hold your hand steady and prevent any mishaps. 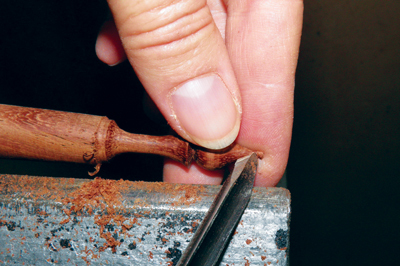 Take small controlled cuts using your finger and thumb support to counteract the pressure being applied by the tool. 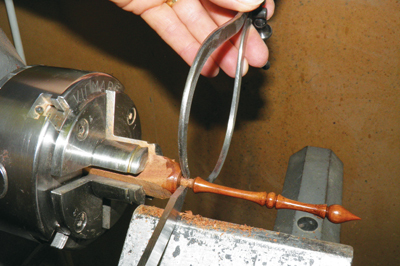 When using your hands to support the delicate finial make sure that your arm is well clear of the chuck and you are not wearing loose clothing; I wear a turning smock with short sleeves so I know I am safe. When the finial has been turned, sanded and polished you can then cut a spigot the correct size to fit the hole drilled in your pot. Gently part the finial off and glue in place with CA adhesive. 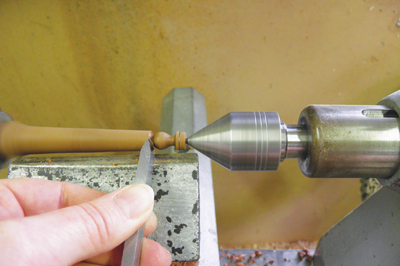 For a finial as an extension to your lid, shape the lid and reduce the diameter of the section of timber to be used for the finial, tapering to a point. 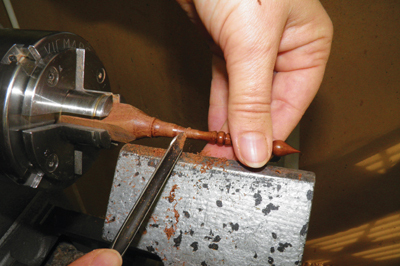 Turn in the same manner as the independent finial starting at the tip and working back towards the lid of the form, gently supporting the finial with your finger and thumb as required. Sand and apply polish as you progress. The opening shot of the zebrano (Microberlinia brazzavillensis) lidded pot with ebony (Diospros spp.) 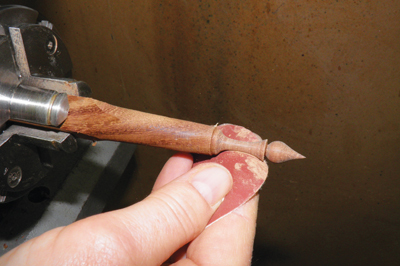 finial shows how it is possible to turn a fine finial; the thinnest part of this finial is just 1.5mm diameter. This particular piece is a decorative item rather than functional due to its delicate finial.